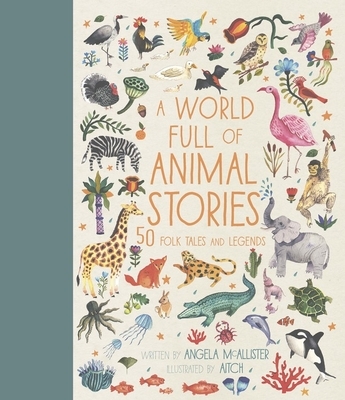 Discover a menagerie of animals with this book that brings together 50 best-loved tales from all around the world! Meet the Big Bad Wolf, the Ugly Duckling, and many other favorite characters from classic stories, myths, and legends in these fresh and vibrant re-tellings. Perfect for reading aloud! Angela McAllister took a degree in Humanities at Middlesex College before becoming a children's book author. To date, she has written more than 80 books for children, including Lincoln Children's best-selling titles A Year Full of Stories and A World Full of Animal Stories. Nomadic illustrator AITCH originally hails from Romania but prefers not to put down roots in any one place; new scenery inspires and invigorates her tactile, folky illustrations and a constant string of exhibitions in cities across the continent pushes her technique further. Her dreamy characters hide among William Morris-esque gardens and bring to mind a bright and bold reincarnation of Victorian melancholy while still retaining a strong sense of her Romanian heritage. "Most of these stories will be entirely new to younger readers. Aitch’s folk-style illustrations, primarily spot art but occasionally full spreads, add flavor to the brief one-to-three-page tales. A colorful collection that encourages readers to learn more about other cultures"
"This handsomely designed, large-format anthology organizes fifty animal folktales and legends by continent. ...The accessible storytelling maintains a pleasing rhythm and folklore-ish tone that should work well for reading aloud. Recommended"
"Rich with imagery and magical happenings, this treasury offers plenty to captivate readers, and Aitch’s pencil and watercolor art neatly bridges the stories’ varied settings."